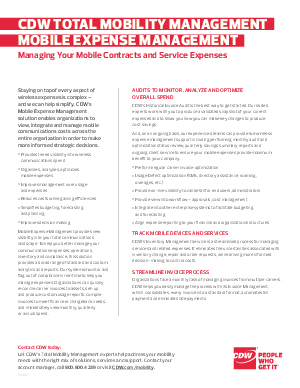 Mobile Expense Management provides new visibility into your total communications landscape. To help you better manage your communications expenses, operations, inventory and compliance, this solution provides a broad range of standard and custom analytics and reports. Our systems monitor and flag out of compliance in real time to help you manage expenses. Organizations can quickly reconcile carrier invoices to assets, set-up and produce custom usage reports, compile invoices to meet finance or chargeback needs, and immediately view monthly, quarterly or annual spend.